Today is the big one. America is celebrating Thanksgiving, and we are all remembering the assassination of President John F. Kennedy on November 22, 1963. And in the musical world not only is today the nameday of St. Cecilia, the patron saint of musicians. It is also the day when Jacob Obrecht was born in 1450, Wilhelm Friedmann Bach in 1710, Joaquin Rodrigo in 1901, and Benjamin Britten in 1913. Follow the links for related articles. Now playing - Gerald Finzi's For St. Cecilia on the 1979 Argo LP ZRG 896 seen above. 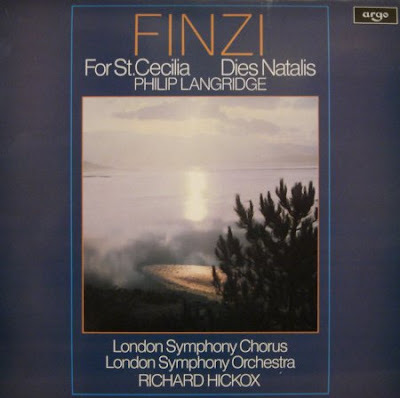 Finzi's Ode for tenor, chorus and orchestra also has a birthday today. It was first performed exactly sixty years ago, on November 22, 1947, by René Soames, the Luton Choral Society and BBC Symphony Orchestra conducted by Sir Adrian Boult. Another fine choral work that deserves to be heard more often. Do you mind if I leave you now with these birthday links? You see, I'm off to celebrate my own birthday. I would also add Boris Becker's birthday, who was somehow art in motion, too. It's amazing what Overgrown Path readers serve up. Add Gunther Schuller as well. Belated happy birthday! Hope you had a wonderful celebration.